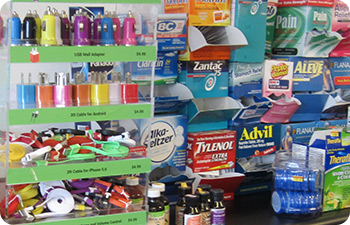 We will supply you with beautiful displays fully stocked with fast selling items. Our displays require only nine inches of counter space. Displays will be placed in high traffic retail locations on consignment. 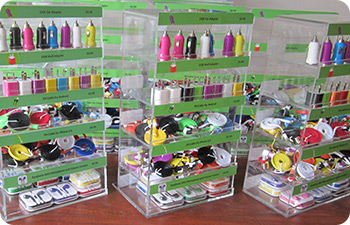 We supply you with all items at a very low wholesale price. That leaves high profit margins to you and the retailers. All marketing material included. No additional expenses. No rent to pay. No equipment to buy or employees to hire. No overhead. Exclusive territories with allot of room to grow. Work only a few hours a month and add locations as you grow. Low risk. Make profit the first month. 1 to 3 Displays fully stocked with 100 items. 4 to 6 Displays fully stocked with 100 items. 7 to 9 Displays fully stocked with 100 items. 10+ Displays fully stocked with 100 items. I am often asked how the location process works, how hard it is to obtain good locations and why retailers will be interested in having the displays placed in their locations. The location gets the display with NO upfront payment. The Consignment program is a term that every retailer is familiar with. 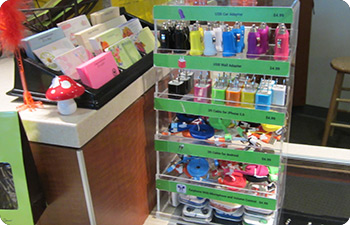 Displays only require 9 inches of counter space and generate good profit to the retailers and to you. Retailers collect the payments for sold item and pay you at the time of restocking. Retailers have no risk of getting stuck with products, they only pay for items sold while they make $2.50 profit per item sold. These are a few of the reasons why it’s not hard to obtain good locations. There is no selling involved on your part. You basically will be offering the display to retailers at No upfront charge and both parties, you and the location will profit from every sale made. You collect at the time of restocking: $3.49 for each item sold. Just one sale a day of full charger (2 pieces) will generate $150 profit to the retailers and $135.00 profit to you each month. It takes 15 minutes to restock a location. Multiply that by the number of locations you may have in your route and you can easily understand the income potential from this business. Easy business to scale. The route owner can add locations to the route on regular basis. Between our locations and other route owner’s locations, we collected valuable data. Based on that data, we put together training material that will be emailed to all new customers. Location list (Type of locations that do well with our products). Invoice sample. (Sample of real invoice so you know how to invoice a store accurately and fast). How often to restock a location. How much inventory to have on hand. Ordering instructions (how to create a login to our site and how to place an order). Picture of our top 3 locations in Fort Myers Florida. (Real picture of actual high volume locations that the average monthly sales are 100 items per location). Introduction E Mail that explains in detail what the top two locations are and a must have in every route and how to obtain them. Adjustments and changes. (We will teach you how to make minor changes to pricing and quantities if necessary that will help you maximize profit for you and the location and will help you keep your customers happy). Help obtaining locations. (You don’t have time to obtain your own locations? We will teach you a proven way to get local help obtaining your locations).